How many meals does the North Okanagan Gleaners make? From our 2017 production year, over 6.6 million servings of soup mix were produced. Throughout the year we receive food donations from farmers, food retailers, food distributors, and individuals. Donations consist of fresh, dried and frozen vegetables, such as: potatoes, beets, onions, garlic, broccoli, brussels sprouts, carrots, tomatoes, peppers, rutabagas, lentils, peas, beans, etc. - in quantities that range from a few pounds to hundreds of thousands of pounds. All the food processed by NOV Gleaners is dehydrated in commercial hot air kilns. The dried vegetables are blended into a mix and are packaged in bags which produce approximately 100 servings each. These are then packed in cardboard boxes, with each box holding ten to twelve bags of soup or fruit. How are the meals made? The vegetables are cleaned and cut up into large pieces by our volunteers. Everything is then chopped into small pieces by a dicing machine, and the diced bits are spread onto pans before being loaded into the dehydrators. The following day the dryers are emptied and the now dried soup ingredients are placed in drums, inventoried and stored in our warehouse. At the end of the year, when we have gathered a good variety of ingredients, our volunteers combine them all into a flavourful soup mix. Apple fruit snacks are also produced. Similar to the process for vegetables, the apples are diced and then dried. Bagged in quantities of 40-cup servings, the fruit provides delicious and nutritious snacks. Where does the food get distributed? In 2016 and 2017, shipments were made to Bosnia, El Salvador, Guatemala, Haiti, North Korea, Tanzania, Ukraine and Zimbabwe. Organizations worldwide are encouraged to fill out Food Aid application forms, and when approved they can receive food as well. How is the food distributed around the world? Boxes or bags of dehydrated meals are easily handled and shipped. Organizations which apply for food aid and are approved are responsible for paying the costs of pickup and transportation. We look for organizations who have people “on the ground” to handle distribution of the food. When does the food get processed and packaged? As the food is received into the NOV Gleaners’ facility, it is processed in order to maximize its nutritional value. The actual processing takes place based upon when it is received, how long it will keep in the coolers, and the availability of our volunteer members. Generally speaking, the variety of food is seasonal with the harvest of each vegetable or fruit. People of all ages, backgrounds and abilities can be helpful by volunteering. Currently our youngest helper is 10 years old and the oldest are in their 80s. What jobs or tasks need to be done? The processing cycle needs people to wash, clean, cut, trim, and chop vegetables, as well as load the dryers. Packaging the dehydrated soup mix also requires volunteers and there are always a variety of other jobs at the plant. No matter the individual’s abilities, there is always a place that will be part of the team and to help. Is there any training needed? Operational since 2009, NOV Gleaners is well-practiced at what they do, and will joyfully teach exactly what is needed. The operations are active from 8:00 am to 12:00 noon, Monday through Friday, year-round. Volunteers chose the day(s) that work best for them. If there is a group interested in volunteering, times can be set up to accomodate them. Please contact the NOV Gleaners to set up a time. Where do volunteers come from? 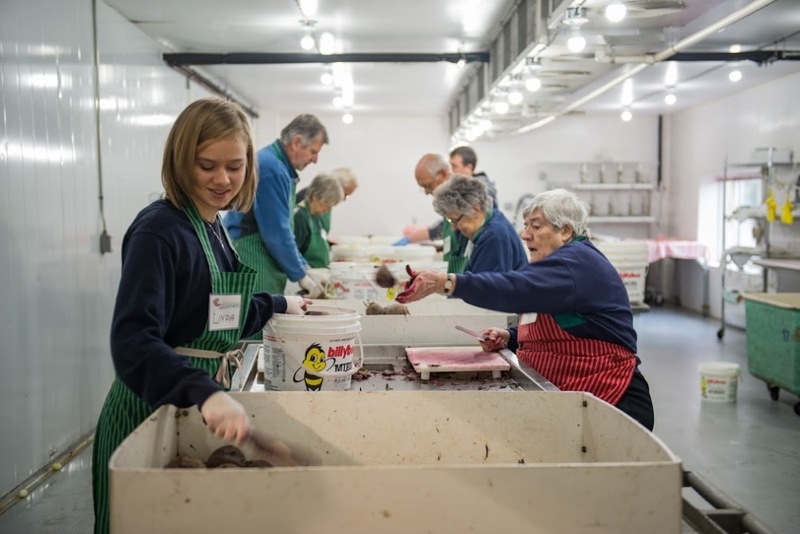 NOV Gleaners is comprised of volunteers from throughout the local region, but additional people come from other parts of BC, Alberta, and beyond. Many travel to the plant and stay in the adjacent Gleaners RV Park while helping out with the processing. Many of the NOV Gleaners volunteers are looking for ways to be helpful and to give back to those in need. Some people are motivated by hearing the stories of those across the globe who are touched by this powerful food ministry. Everyone enjoys sharing the experience with old and new friends. Whatever the reason, the NOV Gleaners team is always thankful for the help. Farmers, food distributors, grocers, and individuals all are welcome to donate to the cause of NOV Gleaners. Any vegetables that can be dehydrated and added to soup are needed: potatoes, beets, onions, garlic, broccoli, brussels sprouts, carrots, tomatoes, peppers, rutabagas, celery, peas, beans, etc. We also have the capability to process frozen or canned vegetables. For fruit, we are limited by equipment and capacity to only handle apples and pears. How much food is needed? From cases to truck loads, NOV Gleaners can handle almost any amount of food donated. Our two coolers can store a vast amount of raw or frozen produce. How often do donations come in? Donations are seasonal with the harvests, so most of our food arrives in the summer and fall. However, throughout the year we also regularly receive frozen vegetables as well as root vegetables. Food is donated by farmers, food retailers, food distributors, and individuals. In many cases there is a local surplus or storage issue that makes a lot of produce available in a short period of time. Unmarketable produce (size, shape, colour, low quality) is also received. Rather than letting food go to waste, NOV Gleaners makes it into much-needed meals. Why should people donate food? Many countries around the world do not have the advantages of abundant food production that North America enjoys. Through the efforts of NOV Gleaners, surplus produce can be turned into life-saving meals, and your donation can go towards improving the lives of those who have few alternatives. See the application for other conditions which might apply.